The Aquios® FS-220C, now with a clear housing, is a perfect solution that will both filter and soften your water. A proven solution to hard water, this all-in-one unit has a carbon block filtration medium rated at 5 microns and a natural, non-salt, food grade additive that will prevent limescale and iron staining from forming on your pipes, appliances and, over time, eliminates existing scale build-up. More importantly, the Aquios system will not remove the healthy and essential minerals found in your water that your body needs and replace them with salt. No bags of salt, no magnets or back-flush and no hassle. Now you can have naturally soft, great tasting water with no chlorine taste or smell in a single, economical and space-saving solution. • Dimensions: 23.4" x 5.4"
The AQUIOS® Salt Free Water Softener and Filter System is a full house water softening and filtration system that utilizes commercial strength technology and performance in a sleek, compact design. This system will ensure that sediment, chlorine and other undesirable materials are removed from your water, and that calcium, magnesium and minerals found in hard water do not build up on your fixtures and pipes. 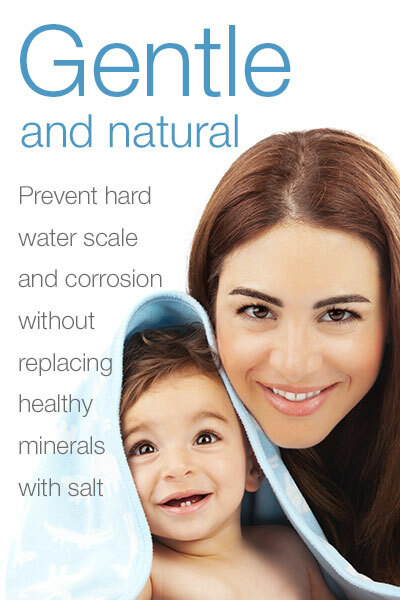 The result, clean, pure and healthy water to you and your family. Unlike salt-based systems, the minerals that make water “hard” are not removed. This is important, because your body actually needs these minerals. Instead, AQUIOS utilizes a natural technology that ensures that these minerals do not accumulate or build up on faucets, water heaters, shower heads, internal pipes or any other device that utilizes your existing water source. This natural technology is a polyphosphate known as Siliphos which inhibits scale deposits and, over time will slowly reduce scale buildup on your pipes and appliances. The result, most scale-causing minerals pass through the systems instead of forming deposits on pipes, appliances and water heater. You will notice a difference in “water feel”, but not one that is “slippery” as is commonly found with salt water softeners. The AQUIOS Water Treatment System is a revolutionary approach to water treatment and conditioning. It combines carbon block filtration (rated at 5 microns) with commercial grade water conditioning to deliver a full house, all in one solution. Our unique design ensures virtually no pressure loss or reduction in water flow rate and requires absolutely no programming, electricity or maintenance. It also comes with a 20 year warranty on the housing and valve. The AQUIOS® Water Treatment System includes your first cartridge and should last an average family approximately up to six (6) months before it requires replacement*. *Existing water quality and hardness may impact the cartridge replacement frequency.